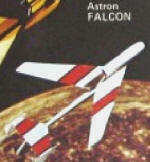 Estes has had two different rocket models called the Falcon. Now, you wouldn't think it would be too hard to come up with a new name, but evidently it was too much of a challenge. 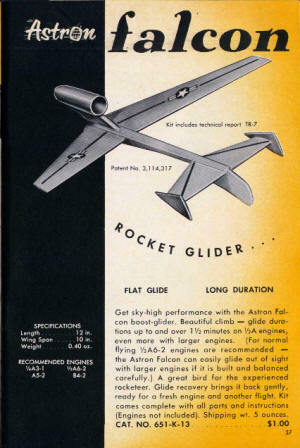 The first Falcon was a rocket boost glider as seen in the image below. I had one of them back in the 1970s when I was a kid living in Holly Hill Harbor, in Mayo, MD. Being both an avid rocketeer and aeromodeler, I really liked the Falcon because it combined the launch properties of a rocket with the recovery properties of a glider. I don't recall the cause of its demise. I lost an awful lot of rockets to the trees behind our house, so that was probably its final resting place. Flash forward about 35 years and Estes again produced a Falcon, but this time it was as a standard rocket kit. In an ultimately unsuccessful attempt to get both my kids interested in rockets, we built and launched a dozen or so different models. 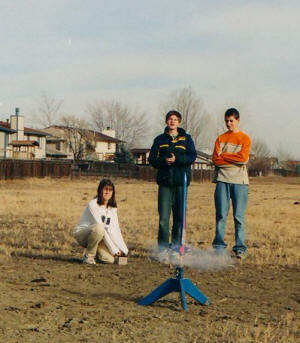 The picture to the right shows Sally launching her Falcon in the field behind our house in Loveland, CO. Her brother, Philip is next to her, and a pathetically stupid neighbor kid is on the right. Sally is grown and married now, but I still have that Falcon in my hobby room. 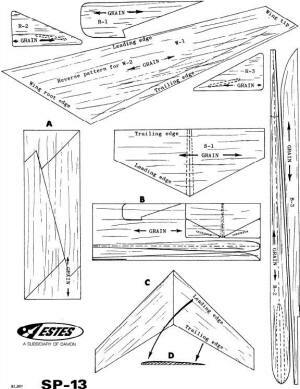 Below is a screen capture of an Estes Astron Falcon Rocket Glider kit (#K-13) that was up for auction on eBay on April 1, 2012. It had 18 bids and sold for $82! 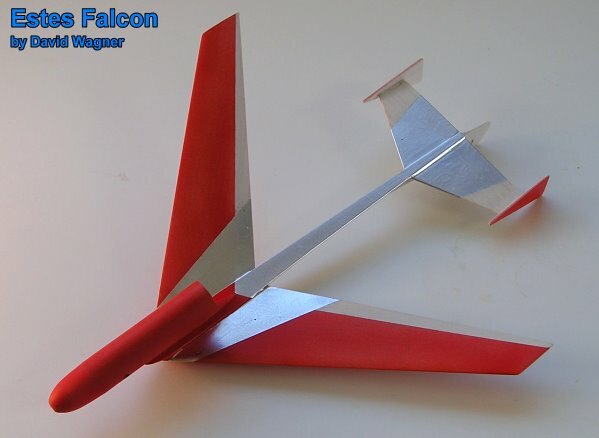 Semroc, which is manufacturing some of the more popular vintage Estes model rockets, has a Hawk boost glider model that I have purchased and plan to build some day. I was just looking through your site. Really enjoyed the old model airplane magazine ads you scanned and featured. I used to look through them every month and had them memorized. Couldn't afford to buy most of those models. I especially enjoyed the old AHC full page ads at the beginning of each issue. Thank you for doing that. Rocket glider update: Had two very good flights with the Astron Falcon two weeks ago. Both almost 90 seconds. Like most rocket gliders, it is very sensitive to CG balance. But once dialed in, it will just float. Last Saturday at the sod farm in Moriarty, we put up a flight with an A8-3, as usual. Very light breeze, but it was enough to slowly move it off the field while in a thermal. Slowly coming out of the thermal but out of sight at a little over 2 minutes. Will build another one, because it has such classic lines. 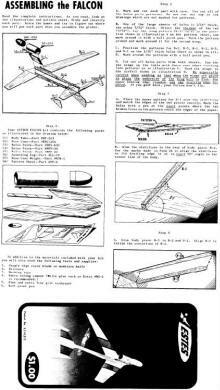 Über rocket boost glider builder David Wagner sent me this note and photos of his excellent Estes Falcon. 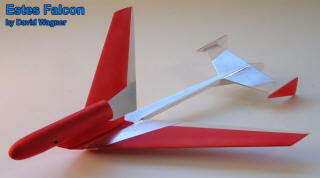 David has established a unique "signature" finishing scheme on his models that consists of a solid red and/or sometimes white base with aluminum foil in a decorative pater in the rocket motor exhaust area. You have plans for the Estes Falcon rocket glider on your website and mention building one years ago. I built this one from plans I saved from the kit I had when I was a kid. I used light wood, etc, and it weighs 8.5 grams. I just finished it recently when I took a few evenings to build the Cheechako model. I haven't flown yet, but it glides nicely. Requires very still air to glide properly... We took it out Saturday, but was a little too windy to put up.